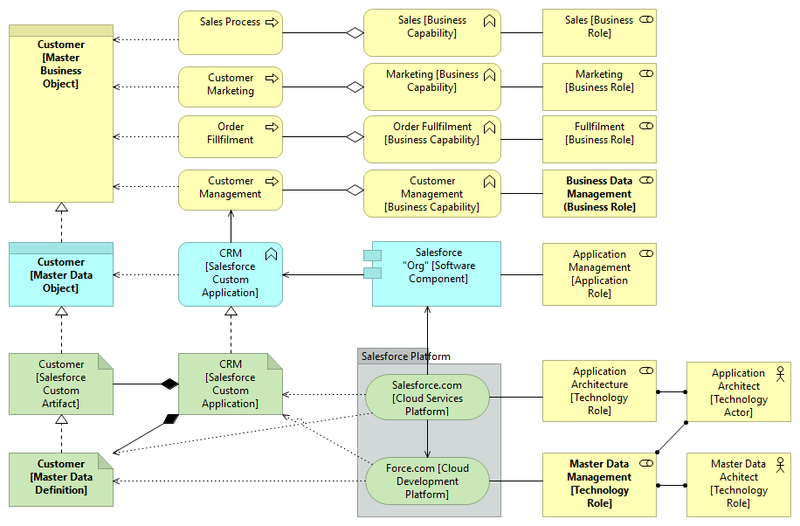 It’s an interesting exercise to try and create an Architecture Reference Model (ARM) in ArchiMate for large, model-driven (metadata-driven) LOB applications like Microsoft SharePoint, Salesforce, Microsoft Dynamics CRM, SAP, Oracle Financials, a SQL Server fault-tolerant cluster, the Microsoft Azure platform, etc. Even though some applications (platforms) are architecturally quite different from one and another (e.g. SharePoint configurability vs. SAP modularity), the fact that metadata drives the configuration and reconfiguration these applications is the most interesting aspect from an architectural point-of-view (vs. manually or semi-automatically configuring a collection of software components or modules). For the next while, I’m focused on creating Architecture Reference Models that in turn can be used as templates for creating logical and physical enterprise architecture models for these platforms. Here’s version 1 (“make it work”) of the Parallelspace ARM for SharePoint 2013/2016. It’s based on my 15+ years experience as a SharePoint architect – working first for the SharePoint product group and then a number of Microsoft solution partners (including my own company Parallelspace Corporation). Note: This is now a “version 2” (make it work better) model. Please email me your feedback (mwherman@parallelspace.net) or add it to the comments below. p.s The model below was created using ArchiMate 2.1 and the Archi EA modeling tool. p.p.s. The above view is what I refer to as a Construction view. 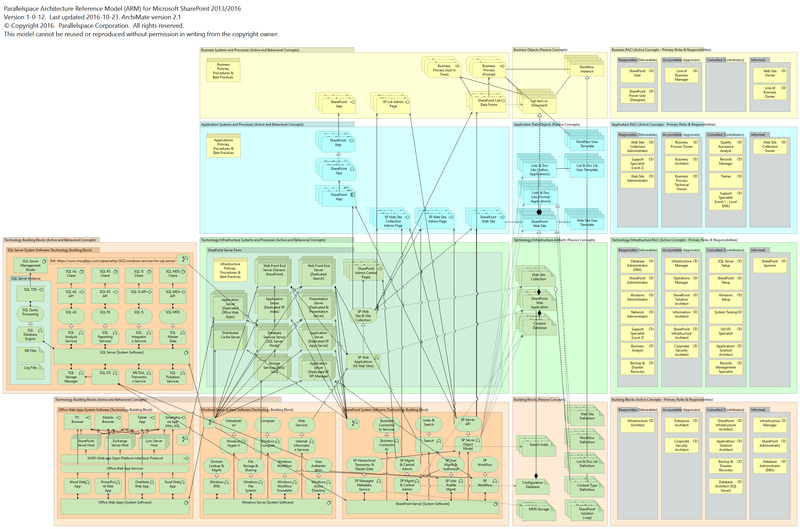 This isn’t a formal view in the ArchiMate specification but it is a view I use when I am building or constructing or updating a model. It’s an “all in” view of the model who’s only stakeholder audience is the Enterprise Architect responsible for maintaining the ARM (architecture reference model). One downside of this view is that it has too many overlapping lines – but that’s OK. Appropriate stakeholder views should then be derived from the elements and relationships in this “all in” ARM. This is my personal blog. 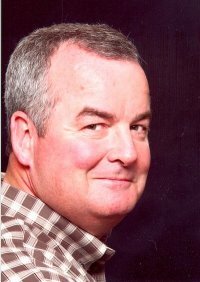 I’m Michael Herman, a technology veteran and corporate enterprise architect, originally from Calgary, Alberta – now living in Toronto. Most people will know me as a “SharePoint guy” who worked for Microsoft Consulting Services and the SharePoint product group as an FTE for the launch of SharePoint Portal Server 2001 and then as a consultant to the product group for SharePoint 2003, SharePoint 2007, and SharePoint 2010. Following my time at Micosoft, I founded Parallelspace Corporation, a boutique enterprise collaboration consulting organization that specialized in Truly Collaborative™ business solutions based on SharePoint, Exchange and Outlook, and Groove Networks Workspace. Today, I work as both a SharePoint consultant and as an architect with broad and deep experience in the fields of enterprise architecture, product management, change management and business transformation. The independent views expressed in these articles are my own. Hyperonomy is the practice of bringing order to data and information to gain increased insight and understanding. For me, in a practical sense, this is about the convergence of enterprise content management (ECM), enterprise architecture and hyper taxonomies. A hyponymy shows the relationship between the more general terms (hypernyms) and the more specific instances of it (hyponyms). A hyponym is a word or phrase whose meaning is more specific than its hypernym. The scope of a hypernym is broader than that of a hyponym.